Firstly this is a long pending post from my order with Zaful for Xmas. Some items arrived as late as in January and till that time, I forgot that I had kept all the items received for future use. However as they say better late than never, so here's what all I got from my Xmas wishlist. I had ordered two leather pouches, one t-shirt and two earrings. If you know that I totally love studs you won't be surprised by this. This time the products u have received are of superior quality. I had just shopped once from Zaful before this, but this time I am amazed by the quality of studs and leather pouches. The t-shirt is of okay quality, but nothing which you cannot wear for a light walk around the garden. The leather pouches quality is amazing, they have two compartments and a small zip section to keep changes or coin. However the pouch cannot accommodate mobile phone and change simultaneously. Still I would rate it a good one as we carry wallet in our vanity bag. One beige colored pouch I gifted to my friend on her Xmas Eve party so that's missing in the picture. 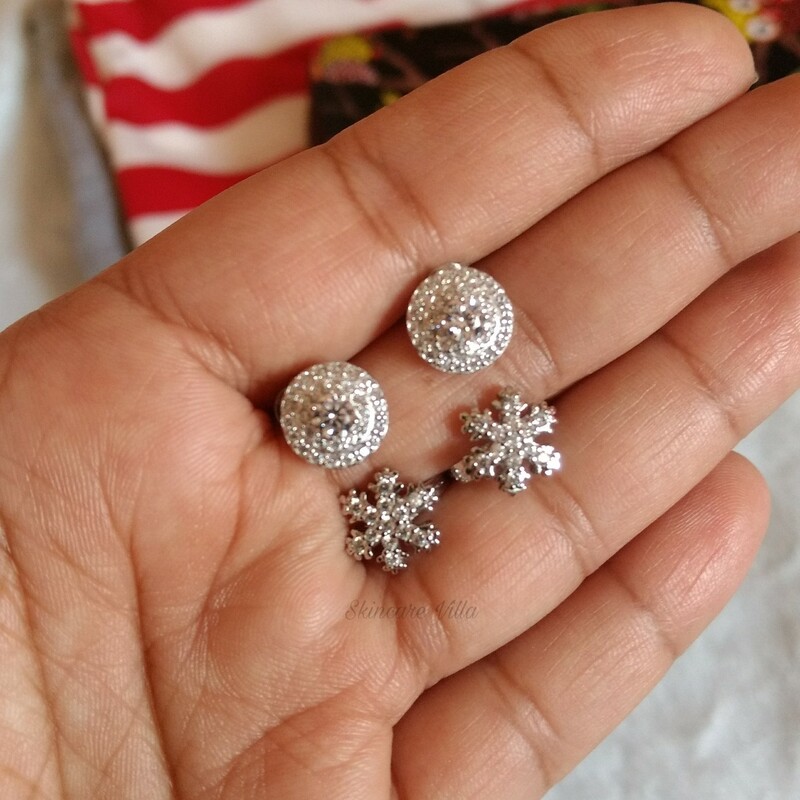 Both the studs look as if they are made up of silver with real diamonds, sadly they aren't 😛. The stone quality is good and I particularly love the Snowflake one more than the diamond one. As said earlier the t shirt is not of that good quality but it's okay. I loved wearing it during my evening walks to garden with my son. Light weight and easy to maintain. I ordered it as I loved the colour combination and stipe work on it. 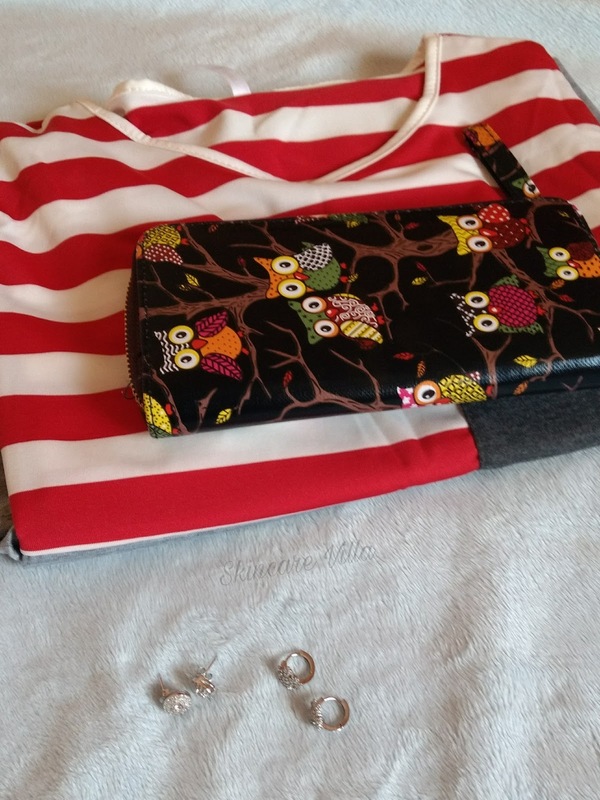 So this was my Xmas wishlist from Zaful which I received in two installments, one arrived with beige pouch and earrings, whereas one arrived 3 weeks alter with t-shirt and black pouch. Overall am happy with the quality stuff Zaful.com provides.